– “fine-tune” the mechanisms we designed together in January for global communication and collaboration. Women will not necessarily matter when it comes to men’s political interests. for us. The women who have stood for parliament have demonstrated this as well. That women belong to the constituencies as well as the men do. Our delegation has been visiting women’s projects in Kampala. 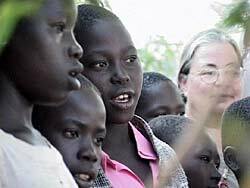 This included a permaculture and gardening project, a center for training for women with AIDS, a craft shop that supports women’s education, a fish pond and a cow project, and an orphanage. 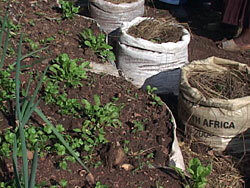 In these photos above a teacher, who also maintains a demonstration garden for container growing in small urban spaces, shows sack gardening, mushroom farming, terrace plots and compost techniques. 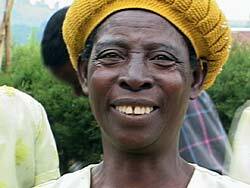 She teaches gardening classes to local women once a week and gardens in her demonstration plots in the evenings. 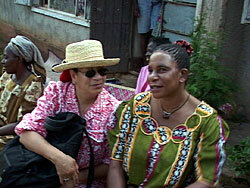 She is in conversation with Helen Young. Here, Sandra Pounder is talking with a community gardener. Gulu District, 4 hours drive north of Kampala (across the White Nile) has been in insurgency for 16 years. 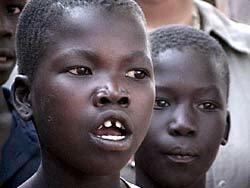 The Sudan border is approximately 60 miles north from Gulu District. 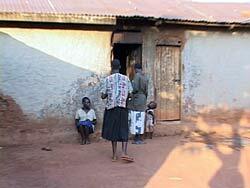 Gulu’s population of 480,000 had to leave their ancestral land where village life had become unsafe. 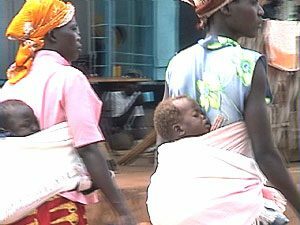 People have either moved to Gulu town or settlement camps for displaced persons. 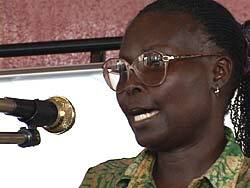 The largest settlement camp in Gulu District, Papo, has 46,000 residents. There are also refugee camps which are for citizens of other nations who have come to Uganda because of insurgency in their home countries. 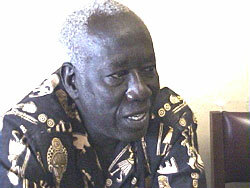 There are refugee camps near Gulu district for citizens of Sudan, for example. 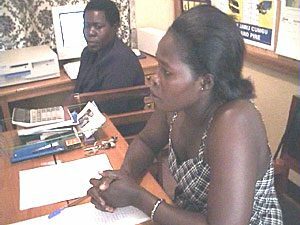 “Family planning is the oldest service provider in Uganda. 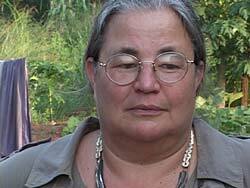 We have been in the International Planned Parenthood Federation since 1957. As you know there has been a shift in funding priorities ever since the collapse of the Eastern Block and the Soviet Union. The leadership of IPPF, Gulu has given a proposal to this delegation that includes clinic services in Gulu town and outreach to the residents of the refugee camps. 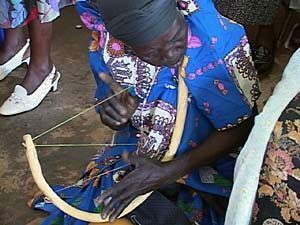 An elder demonstrates a traditional instrument, as women sing songs of welcome and spirit. 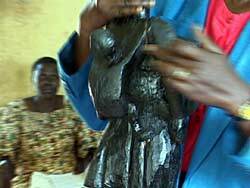 (Holding a carving of a woman) “You find in Uganda here that the men are actually overworking the women. We would like to have our own communication center. Where we sit. We discuss issues. We have a proper address. And if it is possible, we have Internet communications. 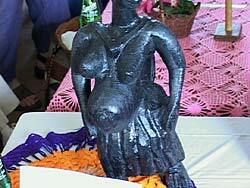 Our objectives are to promote cultural activities. And income producing activities. After that, to help with the orphans. 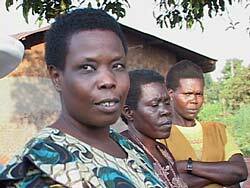 Most of these women are widows. Those who are not widows have orphans of their relatives in their home. Each woman here has more than ten people in their home because of the insurgency that has happened here and also HIV that has been in the district. So they are keeping orphans. And we are counseling also the orphans. Some orphans have become offenders. They do not have proper education. They do not have enough food at home. So you find wrong doers in this district. And so we say, “What should we do with this increase of child offenders?” We found that many children are getting in prisons. And they are our children. Let us put cultural activities and income building activities aside, and let us tackle the children first. All these women are helping, counseling and going to the extent of taking them out of prison and bringing them back to their homes. 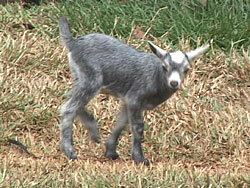 Some are also keeping the child offenders at their home. I have a child who has even gone killing, but I am keeping her at my home, I have taken her back to school. She is doing the same (points to woman) and She is doing the same. Almost everybody here, that is what we are doing. We met with the head of a juvenile justice project. 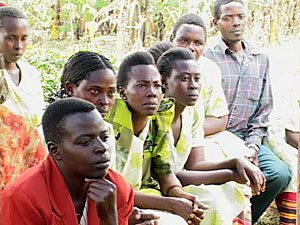 In 1996 Uganda passed legislation that directs the treatment of juvenile offenders. Through Save the Children foundation, Gulu is working to establish community treatment options. In particular, this project is working with the women leaders in Laroo-Pece. Well, there was nowhere for them to stay. 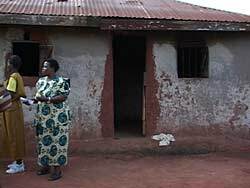 So she turned out her tenants in her homestead, and moved orphans into her own home. In fact, most homes are keeping orphans, integrating them among their own children. “How many orphans and children live here?” We asked. Their love is all gone. It is hard to respond to so many children who need everything. Charlie Toledo, from our delegation, sat quietly with a group of children, holding one hand. “How many are we allowed to take with us?” she asked. Above is the girl’s dorm. looking out the window from the boy’s dormitory. 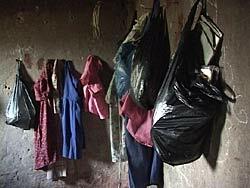 Girls’ clothing hangs on wall pegs. 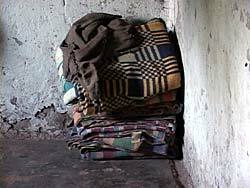 Sleeping blankets are neatly stacked in each dormitory. 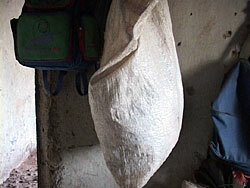 Personal belongings hang in sacks and back packs. Above is the kitchen and courtyard. Mugs on the kitchen shelf. Girls carry water from a pump some distance away, and then pour it into the storage barrel. Mbarara District, 3.5 hours drive southwest of Kampala is also the home district for the President of Uganda. This area was headquarters for the successful guerrilla movement that established the current government and guided the process by which the new democracy and gender sensitive Constitution was written. 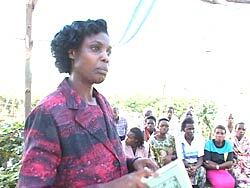 In the photo above, women leaders from local councils in Mbarara District listen as Jolly Mugisha describes WIN-CAWA in their local language. 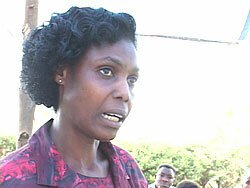 A woman leader of a microeconomic association describes the project to a group of women leaders in the district. She uses their local language, so Hon. Miria Matembe quietly and simultaneously translates her presentation to English for the California delegation. Their association is young, but they have done something and this is what she would like to tell us. Besides the goat project, each member has another project. And that project is contributed to by the members. Two members have chickens. Two members have pigs. Two members have honey. They have decided that every member must have fruit trees and vegetables for good nutrition in the home. They would like to do networking by visiting other groups to see their projects. They do not have enough money. They would like to have a fund to run as a revolving fund among the membership so that they can raise fees for their children’s school. They would like to have modern bee hives. They do not have sufficient market for their products. 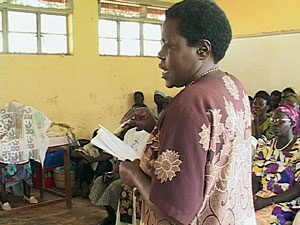 The speaker thanks Honorable Miria Matembe for her work and support of these womens’ projects. 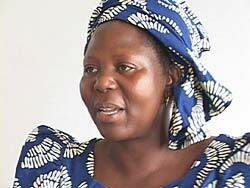 That she has played a big role in getting rural women better opportunities. And they thanked the visiting delegation for coming, that in the past they have not had visitors like the WIN/CAWA delegation. 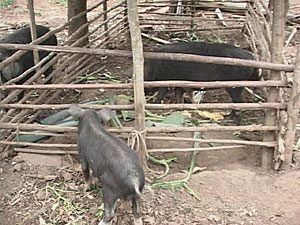 About the pigs, the mothers can produce at 4 months. Then when we have piglets we fatten them for market. We can use this to reduce the poverty in our homes. Above is the young woman who owns the pigs you see here. Rutehenda B. Robert, Mayor, Mbarara District Council greets the delegation and provides an historic overview of governance in the district under the new democrary. Helen Young, from the California delegation asks: How have so many changes in your country been made so quickly? Mayor: We are improving so much because we had 30 years of stagnation. We wasted 30 years, and everybody knows that we wasted 30 years. Tanzania is way off. Kenya is way off. We are behind. So we are the most productive area in this region. We lacked one thing, the governance. 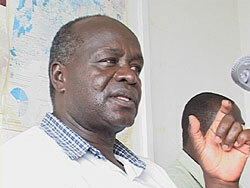 But I think Uganda will again be the pearl of Africa, as it used to be. 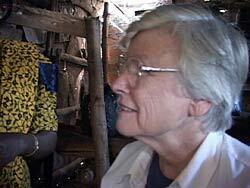 It is very good to go to Uganda and see for yourselves (he tells the U.S. women) Because we have a lot of black stains. In the world, whenever you said “Uganda” they cried , “Amin.” But now a Mayor has to be elected, has to go through the public scrutiny. Hon. 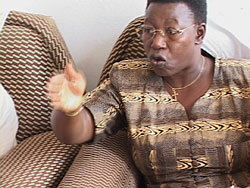 Matembe: “You must have a body where if there are 5 members, two should be women, or at least one. “I want to know how you put your adverts. We have said we should use a gender neutral language. If it says “He must…” , “He must…,” “Do you put stroke / She in your adverts? That is what you are supposed to do. You say, He / stroke / She (as in he/she).” And so women say, “So we are also wanted there.” Otherwise they will think that these jobs belong to men. Your are welcome, you are very welcome! These words of greeting echo across Uganda. Where ever we go, women reach to shake hands and we are welcomed. 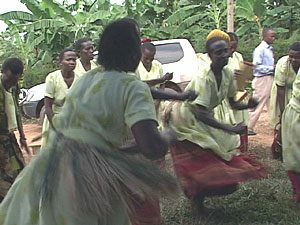 When there is time, the welcome includes song and dance. 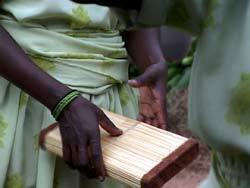 This simple rattle, made of closely tied grass, is used to set the dance rhythm. The sound is like rustling grass. To create rhythm, women strike alternatively with their thumbs. Right, left, right, left. The songs are structured with a lead part and response by the singing group. Because they are also a women’s group, the singers are dressed in their group dress. Each local woman’s group designs and sews their own costume. 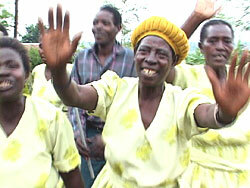 For more photos of womens’ groups and their costumes, watch for the interview with Regina Sanyo from Kisoro. The lead singer addresses the guests and sings out the message to them. This message is then repeated by the group and woven into a chorus verse. The lead and refrain overlap one another, creating beautiful combinations of layered harmony. During this exchange, the energy builds, until it breaks out into a vigorous dance segment where women twirl and shake the grass apron that it tied over their hips. The sound of rattling aprons adds to the rhythm. The audience joins in during these dance segments. Here, Honorable Miria Matembe joins the dancers along with members of the delegation from California. The cooking hut is part of every homestead. 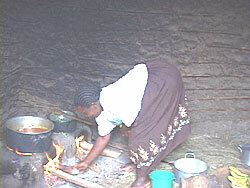 The fire/hearth is on the floor, and women bend way over to add fire, stir food, and make adjustments in the cooking process. 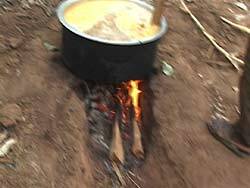 To feed the people at this luncheon (about 75 people) the women cooked among the trees in the banana plantation on fire pits dug into the ground. The fire burns in the pit and the metal soup pot is placed on the ground above the fire. 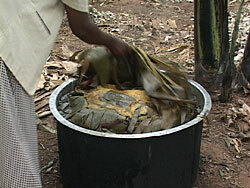 Here, a woman is removing banana leaves that surround steamed matoke. 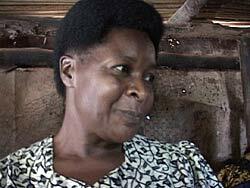 Matoke is a green banana that is cooked and served at every meal in Uganda. It is the staple of Ugandan diet (in combination with chicken, goat, fish and beef) Most of the banana plantations in Uganda are matoke. 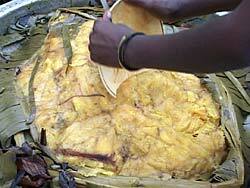 Matoke is lifted from the pot and placed on banana leaves to be served for lunch. This twig stand is the dishwashing station. 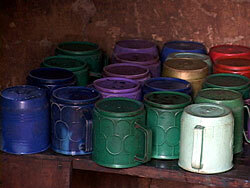 Water is boiled for washing and rinsing. 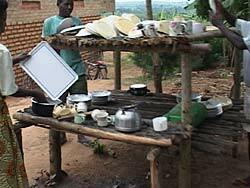 Then the dishes are stacked to dry. Hosted at InSysCo in Tallahassee, Florida.